I submitted my thesis to my reader at the beginning of this month. It was a great feeling, but it also made me wonder: “Wait…this is it? How did I even get here?” It’s weird and I still haven’t quite realized that, after I get the feedback from my reader and submit an updated version to the department, I will be done! Done with a project that has been evolving since my first semester in the program. Different from the current curriculum, my cohort did take the research methods course during the first Fall semester (it is now taught in the second one). 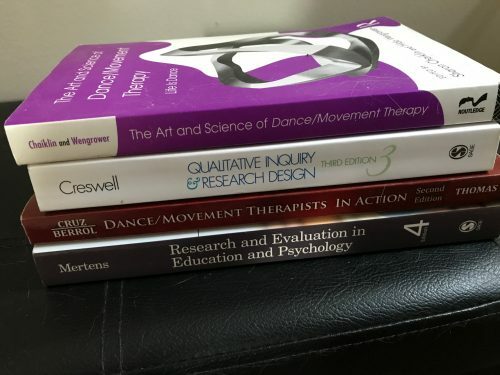 Unlike my undergraduate classes in research methods, however, this one focused specifically on the methodologies, data collection and analysis methods important for the field of dance/movement therapy. 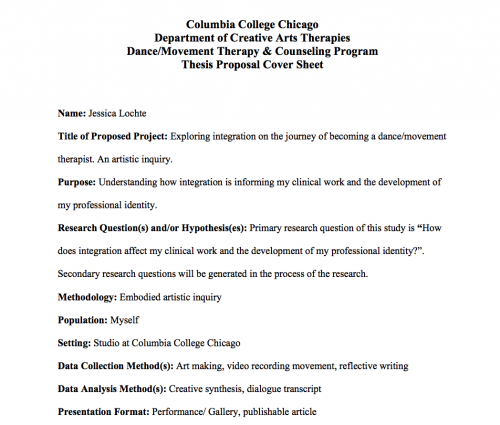 Focusing on qualitative research, this also included the methodology of artistic inquiry. From the beginning I was skeptical about that approach…too wishy washy…completely different from my logically and quantitatively wired brain. Well, guess what I ended up with? After not having any research or thesis courses during Spring, we engaged in our first attempt of writing a literature review during our second summer. While the idea was that we would focus on a topic related to our (possible) thesis topic, it turned out that most of us didn’t quite know yet what we wanted to focus on in our theses. After all, we had just started our first internship (field placement) and new ideas appeared to pop up in response to every group, individual assessment, or supervision. So I decided to focus on a topic that had been coming up since I started the program: the shame and guilt that I experienced whenever I was confronted with my national identity. Ultimately, this culminated in a literature review titled “Transgenerational Transmission of Large-Group Chosen Trauma in Postwar Germany”. Writing my literature review showed me that focusing on such a narrow aspect of my “self” wasn’t satisfying. I was much more interested in the interactions of different parts of my self, or selves. Therefore, during my second Fall semester, I sat down with the thesis coordinator of our department, trying to draft a thesis proposal that would reflect this curiosity. 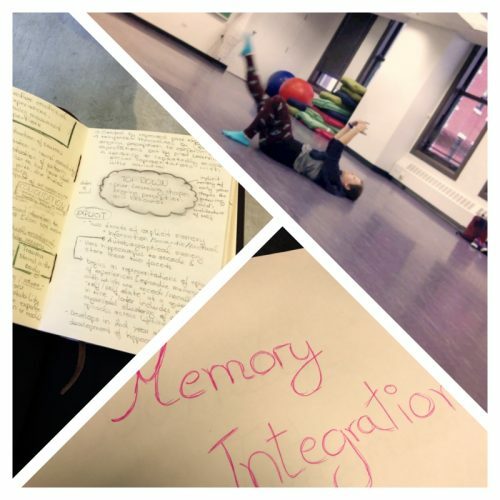 In this process, I also realized that I was strongly drawn to the topic of integration and the framework of interpersonal neurobiology. Why not try to incorporate all of these ideas into a thesis topic? 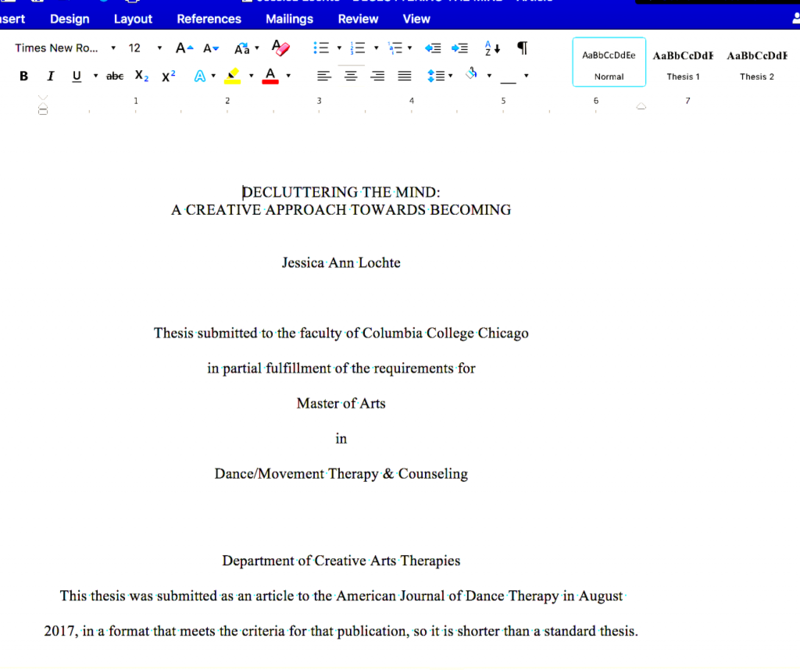 So at the end of the semester, I officially submitted my thesis proposal for a thesis titled “Exploring integration on the journey of becoming a dance/movement therapist. An artistic inquiry”. For the rest of my program I did not really engage in it except for what was expected. During my final semester, I did draft an abstract and worked on a poster, which I presented at the departments Research Poster Celebration. However, I did not start my “real” research process, more specifically a rough draft of my literature review and my 10 weeks of data collection, until the end of September. I intentionally made this choice, knowing that working on my thesis during my final semester would be unrealistic and acknowledging that I needed a couple of months to recuperate and gather myself to engage in this process. Otherwise, I would have forced the process, which I am convinced would have been reflected in my results. But when I started, I fully committed to it (you can read about the process of data collection in my past blog posts here and here). As mentioned at the beginning, I am now, after 11 month of working on my thesis, in the final stage. I submitted it to my reader and are waiting for the final feedback. 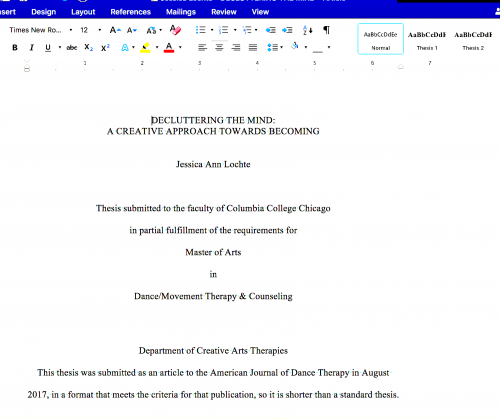 After I receiving this feedback, I will update my thesis and create two versions: a thesis version following the guidelines of the Department of Creative Art Therapies, and another version following the guidelines of the publisher (Springer, in my case). The last step, then, is submitting it at the beginning of August. And who knows? Maybe my thesis will be published. Maybe not. But that will be the concert of another journey and probably the life-cycle of an article.